All leather goods are handmade by our leather artisans. We use the highest quality fine grain leather combined with the best stitch work to provide you with a premium quality leather pen sleeve. Unique design: simple design, timeless classic, minimalist style is a special, great and refined for your friends. Material: Top grade genuine tanned sheepskin leather, it will an ideal companion for your luxury pens, protect your love pen from damage and scratched. 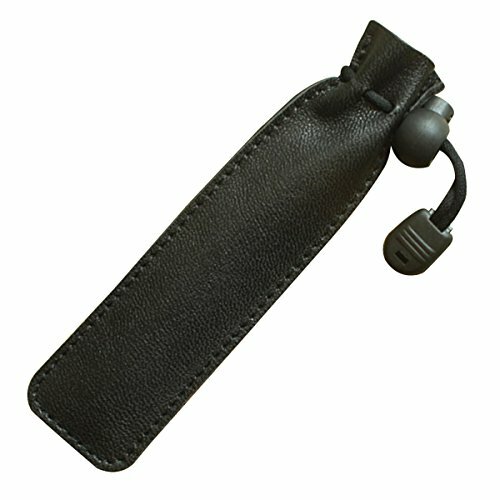 The leather pen sleeve with drawstring, keeps your pen secure and prevents it losing. Style: handmade, handcraft, handcrafted, vintage, distressed upper, retro, nubuck, suede, simple, luxury, high-end, unique, distinct, exclusive, elegant, classic, stylish, refined, durable, high quality, top quality. Available sizes: 13.5*4cm(5.31*1.57 inches), with the error range of 3%. Suitable for fit for Montblanc boheme style single pen. Note: The pen in the image is only for presentation, not for sale. We only sell the leather pen sleeve.